Money Metals readers may remember my November 2014 report in which I discussed how gold flowed into China in "tributary fashion" like small streams flowing into a giant one. In this case, the gold has been streaming into China's increasingly massive thousands-of-tons gold hoard. 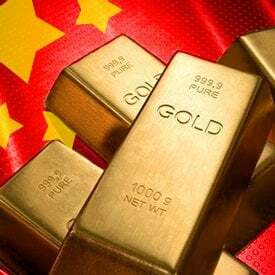 In January, 2015, I penned an essay titled "China's Global Gold Supply "Game of Stones," outlining China's long-range goal to dominate the world's physical gold market. Well, events have moved massively forward since then. I want to update you as to just how much things have changed – and how close we may be to experiencing a "defining moment" in the gold market. First: Buy physical gold in world markets, re-fabricate it when necessary (into .9999 fine bars in Switzerland), and ship to the mainland. Second: Hoard all domestically-produced gold... which is now being done, even when produced from operations with foreign-partners. This is also true with silver production, e.g. Silvercorp Metals – a Canadian silver/lead producer with operations on the Chinese mainland. Third: Partner with (e.g. Pretivm Resources; Barrick Gold-Pascua Lama) or buy outright, gold explorer-producers located on foreign soil. Right now, China is vastly understating what it actually holds as well as how much is being imported. This deception is easier than ever because a significant amount is no longer routed (and thus reportable) through Hong Kong, but rather through other mainland entry ports. What the authorities admitted holding as of last summer was almost unbelievably small compared to what even the official figures streaming through Hong Kong alone, plus domestic production add to the total, and China is now the number one global gold producer. 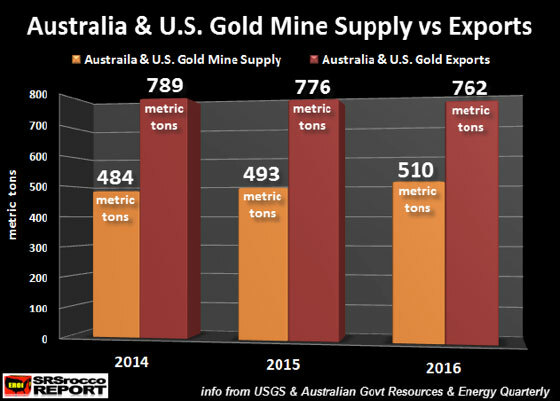 As reported by Steve St. Angelo China has, during Q1, 2017, imported a record 57.4 metric tons of gold to the mainland, from Australia. In Addition: A parallel determinant is China's effort to lessen its holdings of U.S. dollar reserves, by signing infrastructure agreements (denominated in yuan) with countries participating in its massive, long-term New Silk Road project. It's been reported that China has even approached Saudi Arabia about yuan-based oil sales – a direct threat to the decades-long monopoly of the U.S. petrodollar. Steve St. Angelo reports that so far in 2017, scrap gold recovery is down sharply, even though the price of gold has risen – an unusual historic occurrence. His projection for the year? "...as the price of gold has increased in 2017, global gold scrap supply will fall by almost a third, or 32% versus 2010... this major gold market indicator trend shift suggests that individuals are now holding onto their gold rather than sell it for a higher FIAT MONETARY PRICE." Precious metals prices have been in a cyclical decline since mid-2011 – not unlike the last secular bull market in the 1970's – before gold's eight-fold rise less than two years later. It's understandable that you might meet this latest suggestion of an unexpected, massive rise in the price of gold and silver with skepticism. A rise that could take place so quickly that those who hesitate could not react before prices had climbed far above prevailing levels. Before the supply cupboard had been swept clean. But the truth is – it's not a pipe dream, not blowing smoke, not wishful thinking. This is not just possible, but increasingly probable. Everything in life involves playing the odds. If something is "unlikely" but possible, and if that something taking place had the potential of being a "game-changer," would you not seek to prepare for it in some measure? A vertical up-move in gold would place you in a tidy profit position, even if you held a relatively small amount (e.g. the oft-touted 5% of your investable assets). So, it's not necessary to mortgage the house or go into debt in order to "participate." I believe it's almost "a given" that precious metals will resume their secular bull run, which could continue for the next three to five years. If you agree, does it not make sense to begin (or continue) a conservative metals' acquisition plan? With little worry as to the price where you began? It's not that difficult. Either buy metals when you have some surplus investible funds, and/or do so on a regular, dollar-cost-average basis. If the "China card" never gets played, you'll still do well as metals' prices advance over the coming years. You'll have been purchasing "paid-up insurance" for the rest of your holdings, hedging more as time goes on. And one more thing. Don't think of it as "spending money" on buying gold and silver. You're simply exchanging continually-depreciating "paper promises" – the enduring term coined by David Morgan at TheMorganReport.com – for "honest money" which has stood the test for millennia and will likely continue for as far as the eye can see. When the market reverses, the diminished physical anchor to paper claims, concerns over title and encumbrances on central bank bullion, and worries over the drift of public policy will drive liquid capital into gold. However, this time around, it seems to us that the major recipient of flows will be the physical metal itself. Holders of paper claims to gold will receive polite and apologetic letters from intermediaries offering to settle in cash at prices well below the physical market. To those who wish to hold their wealth exclusively in paper assets, implicitly trusting the policy elites to resurrect normally functioning capital markets and economic conditions, we say good luck. For those who harbor doubts on such an outcome, we say get physical.